In 1949, Donal Greenleaf wrote a wonderful memoir on his summers as child on Watchic Lake at what is now the camp at Watchic Rd 7 (TCV for “Twentieth Century Views”) . Thanks to his niece, we have posted the full memoir here. Below are some excerpts of the Watchic experience of hundred years ago. Watchic was way off the beaten path. It was a Sabbath day’s Journey to get there from New York. Sometimes we took the New York-Portland boat but usually the train, with a change over and often a night in Boston. The State of Maine express, which started about 1906, simplified matters greatly. 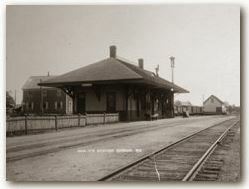 In those early years I came into Portland through Gorham. We could then leave New York at 9:00 pm, get off at Gorham at about 6:30 am and reach Watchic for breakfast via Mr. Higgins ‘fast-moving horse and buggy.